King Ranch trim. CARFAX 1-Owner. Sunroof, Navigation, Heated Leather Seats, 3rd Row Seat, Captains Chairs, Alloy Wheels, Turbo Charged, Trailer Hitch, EQUIPMENT GROUP 401A, 2ND ROW BUCKET SEATS, ENGINE: 3.5L V6 ECOBOOST, POWER MOONROOF. CLICK NOW! Leather Seats, Third Row Seat, Power Liftgate, Rear Air, Heated Driver Seat, Heated Rear Seat, Cooled Driver Seat, Back-Up Camera, Premium Sound System, iPod/MP3 Input, Bluetooth, Trailer Hitch, Aluminum Wheels, Remote Engine Start, Dual Zone A/C Rear Seat Audio Controls, Privacy Glass, Keyless Entry, Remote Trunk Release, Steering Wheel Controls. POWER MOONROOF, 2ND ROW BUCKET SEATS, ENGINE: 3.5L V6 ECOBOOST (STD), EQUIPMENT GROUP 401A Voice-Activated Navigation System w/HD Radio, SiriusXM Satellite Radio Activation and programming subject to geographical location and availability, Power Deployable Running Boards. 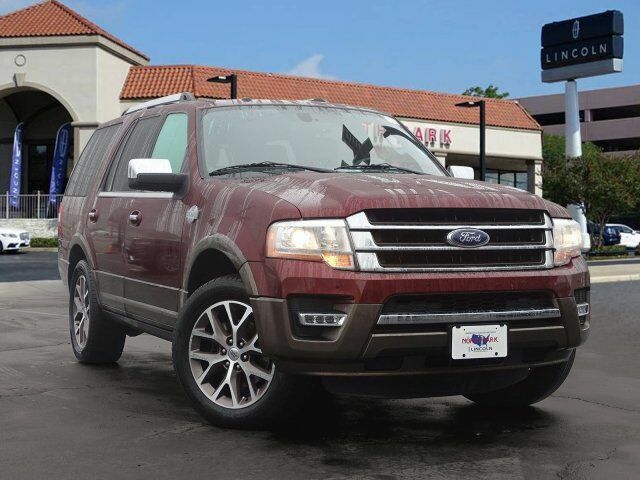 Ford King Ranch with Bronze Fire Metallic exterior and Mesa w/Ebony interior features a V6 Cylinder Engine with 365 HP at 5000 RPM*. Edmunds.com explains Roomy third-row seat; strong and efficient turbocharged V6; easy-folding rear seats increase interior flexibility; tows more than similarly sized crossovers..